SOCAR Energy Ukraine, a subsidiary of Azerbaijan’s state oil company SOCAR in Ukraine, with the start of the navigation season, has launched two oil bunkers - offshore filling stations for small and medium-sized ships, the company said in a message on May 10. One of the oil bunkers is located in the territory of the Muromets park, Kiev and the second - in the Odessa region, in area of the yacht club "Sauvignon". SOCAR floating gas stations offer brand diesel and petrol Nano, as well as gasoline AI-95, the company said. The representative office of SOCAR was opened in Ukraine in 2008. In 2009, the company purchased about 20 filling stations of the Tala-Nafta network in Odessa and Nikolaev regions, as well as a large oil depot Svitanok in the Odessa region. In 2010-2011, the company took control of the fuelling networks ONIO (four filling stations in Kiev and the region) and GFC (in Lviv region). 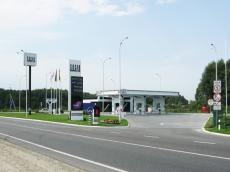 In August 2012, SOCAR received permission from the Antimonopoly Committee of Ukraine to purchase 26 filling stations and one tank farm of the Kalina group. The network operates 60 petrol stations in Ukraine, as well as two “Baku-1” oil bunkers in Kiev and “Ganja” in Odessa. Since late 2016, the company has also been engaged in trade of natural gas in Ukraine.